For those of you who have only read the newer adventures of everyone’s favorite waterfowl, he hasn’t always known Tara. Back in the early days, he hung out with Beverly Switzler, a dancer. They would go on adventures together, mostly due to dumb luck or some cosmic accident causing them to get into trouble. An old villain of Howard’s named Doctor Bong had a creepy crush on her and has tried to kidnap her on at least one occasion. 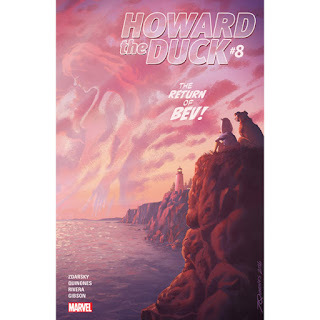 For the most part, Beverly stopped being used in the eighties, despite being a regular character and appearing in the maligned film adaptation of the comic. To start off, just look at that gorgeous cover. Apart from being beautifully drawn and colored, it perfectly encapsulates Howard’s point of view. He’s in a strange world, one of a kind, and constantly looking to get back to his own dimension. There he is, sitting by a lighthouse, watching the skies, where you can see Beverly’s silhouette looking downward, obviously upset about something. As for the actual reunion, I found it to be a touching and heartfelt story. While it does feel too short, although that could be my own bias, it provides a plausible explanation for her absence and some character development. It’s even bookended by classic panels from the original Howard The Duck series, or at least new panels that were altered. 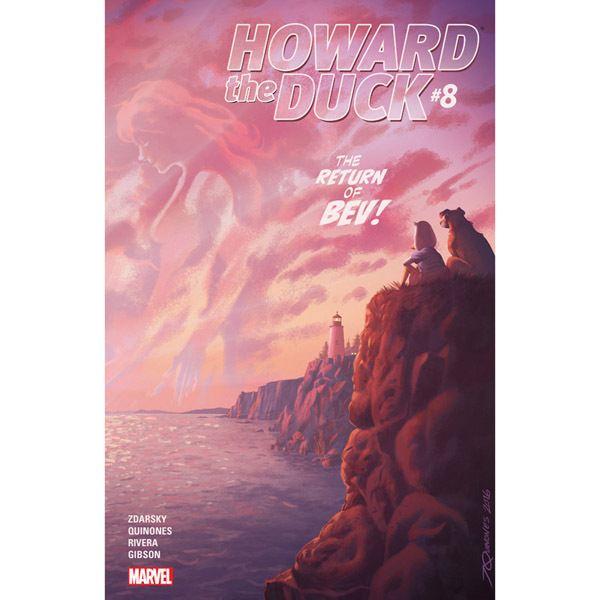 I haven’t read Marvel Essentials: Howard The Duck in a long time. It even sets up a possible reason for her to return to the series. Now, the ending to this issue was revealed in an interview with The Hollywood Reporter on Tuesday. As such, I’m going to go over it here, but I warn you SPOILERS AHEAD! Actually, not one, but two Beverly Switzlers return in this issue. Lea Thompson appears as herself, mysteriously in the Marvel Universe. She appeared as Beverly Switzel in the Howard The Duck theatrical film. Her appearance seems promising. I hope that the upcoming three-part story arc is as good as Chip Zdarsky promises. If it’s anything like this issue, it most certainly will be.